2-step verification also know as two-factor authentication (2FA) adds an extra layer of security to your CheckMarket Account. In addition to your username and password, you’ll enter a code that CheckMarket will send you via text or a mobile app. 2-step verification drastically reduces the chances of having the information in your CheckMarket Account stolen by someone else. Why? Because criminals would have to not only get your password and your username, they’d have to get a hold of your phone. Sign in to the CheckMarket website (if you haven’t already). Click on Account at the top of any page to open your account menu. 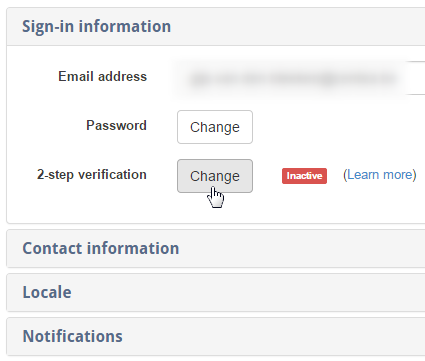 Scroll down to Two-step verification, toggle (change). Enter the phone number where you’d like to receive text messages. You’ll be sent a security code by text message. Verify your phone number and enable two-step verification by entering this code when prompted. Once your app is configured, you’ll need to enter a security code generated by your authenticator app to verify setup and enable two-step verification. The apps will generate security codes even when cellular/data service is not available – useful when traveling or where coverage is unreliable. How do I grant others access to my account?